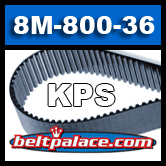 Home > Scooter, Golf, and Karting Belts > 360-KPS8m-800 Replaces GATES 8MGT-800-36 Poly-Chain Belt. BANDO 360-KPS8m-800 Replaces GATES 8MGT-800-36 Poly-Chain Belt. NASCART Drive Belt. 360-KPS8m-800 Replaces GATES 8MGT-800-36 Poly-Chain Belt. 800-8M-36 (Kevlar) BANDO Synchro-Link KPS II. Belt 360-KPS8M-800 Replaces GATES 8MGT-800-36 Poly-Chain Belt and product ID 92752100. Ultimate Replacement for Formula K (NASCART) part 120319 (Go Kart Belt 120319). Kevlar Construction: 800mm L x 8M-GT X 36mm W, Ultra-Heavy Duty. KPS II Belts deliver up to 5x more power than standard STS belts. Polyurethane constructed reducing wear and rubber dust.